Natural Sites of Rhode Island’s Historical Memory by Robert A. Geake Amid the still rugged landscape of Rhode Island and its surrounding New England states are many sites of historical memory. Some are linked to events dating back to the first indigenous-european encounters, other sites are places of ceremony whose history goes beyond time out of mind. All these places known as natural historic sites, were well known to the indigenous population long before we later generations of European settlers claimed the sites as our own. For instance, in Lincoln, Rhode Island, the ledges, natural rock formations, and small caves that form part of the natural landscape once known as Quinsnicket[i], were well known camping places for Nipmuck and Narragansett passing through the area. These sleeping places were likely less used by around 1700, when Eleazor Arnold kept a bed for Native Americans at his tavern on the Great Road nearby. This natural landscape was later expanded upon by Stephen Hopkins Smith, who owned the land on which he could cultivate gardens and transplant trees of all species. He did this as well on the grounds of his “Hearthside” manor across Great Road. He literally created much that would later become the state park known today as Lincoln Woods. One of the first natural sites that would become associated with the founding of the colony of Rhode Island, actually lies a bit above the border in Swansea. 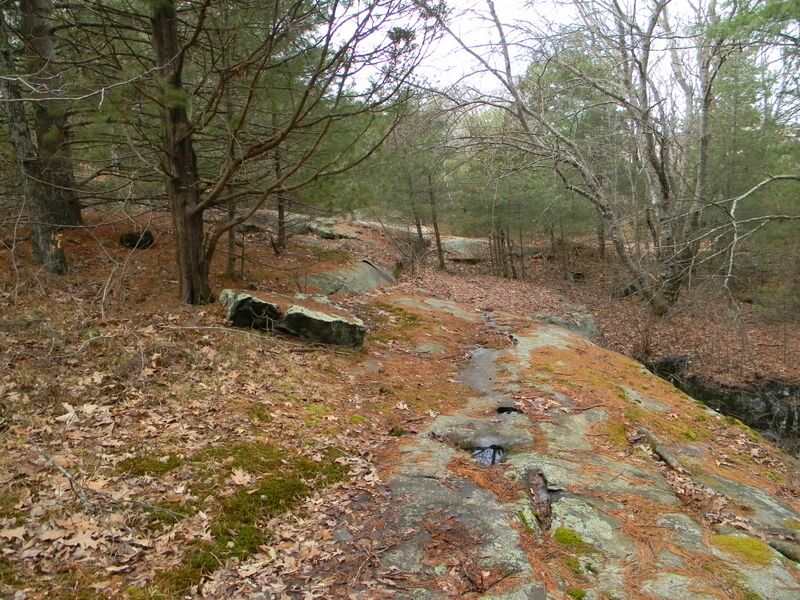 In a wooded area just north of the historic Chace Farm, lies a large rock formation, remnants of a large ledge that one can still follow a considerable distance to the northeast. 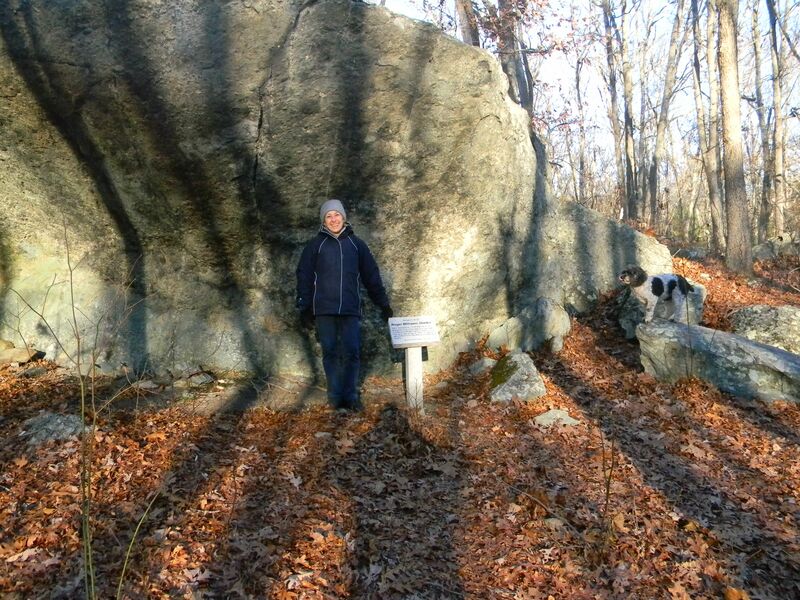 At the end of this ledge lies a large, overhanging rock shelter named Margaret’s Rock, long associated with Roger Williams and his flight from Salem, Massachusetts in the winter of 1636. (Above) Joetta Kirk and Maggie, caretakers of Margaret’s Rock. Photo by the author This area was known as the “Sachem’s Knoll”, one of several in Southern New England, usually individualized by its proximity to a well known location-in this case, the Kickemuit River. William’s was ill as early as the summer of 1635, and still suffering the effects of this unknown ailment when he received notice that he was to be arrested at his home. He fled alone in January, informing the Wampanoag sachem Massasoit of his predicament. Tradition tells us that he was led to the rock, which forms a natural shelter from the rain and wind, and here nursed back to health by a Wampanoag medicine woman named Margaret. During this time while Williams felt he was at “… the mercy of an howling Wildernesse in Frost and Snow”, he received an unsympathetic letter from John Cotton in Boston. “I speake not these things (the God of truth is my witness) to adde affliction to your affliction, but (if it were the holy will of God) to move you to a more serious sight of your sin…it pleased him to stop your mouth by a suddaine disease, and to threaten to take your breath from you[ii]”. Cotton would receive no answer from Williams, but the banished minister recovered by spring, no doubt greatly helped by the Indian medicine woman’s treatment. 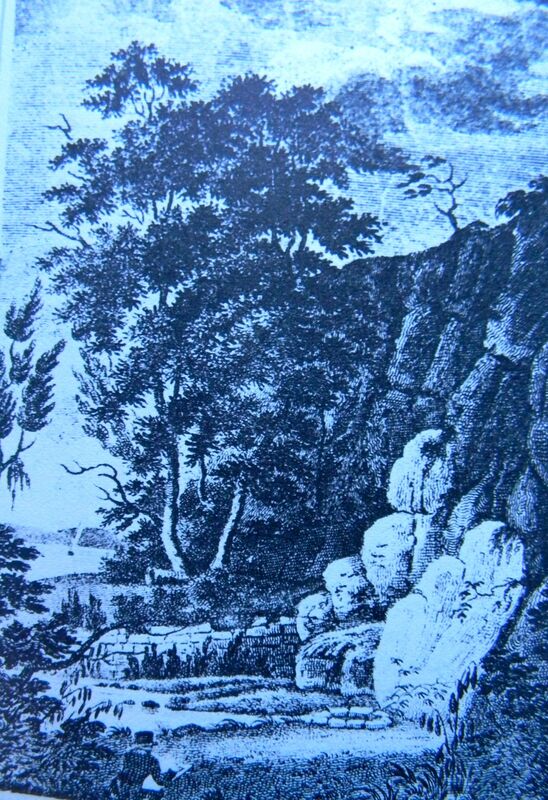 Long known to locals familiar with Swansea lore, the first expansive article concerning the rock and its history was written by historian J. Earl Clauson for the Providence Journal in the 1940’s who identified the rock formation as “Roger Williams’ Cave”. 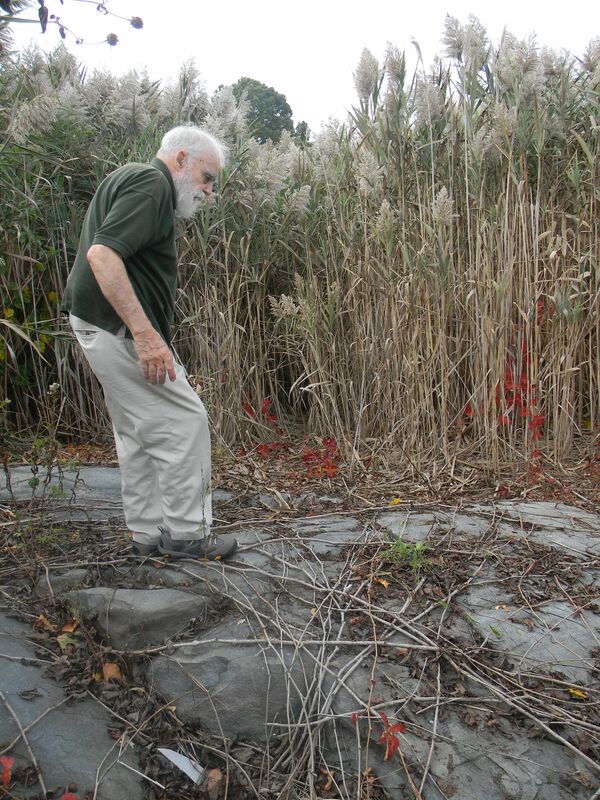 The natural formation had long been on the property of the historic Chace Farm, most recently with caretakers Robert Chace and Joetta Kirk maintaining the site for a handful of visitors each year. The Roger Williams Family Association was granted the request to place a stone plaque at the site, and makes a pilgrimage to the rock each spring. The property was recently sold, but the new owner has granted the Association the same privileges. On a recent visit, guided by Joetta Kirk, we skirted the woods and fields around the rock before heading back in the cold to wigwam hill, a low-lying windswept knoll with a view of a run of the Kickemuit River. Tradition holds that at the top of this puddingstone outcrop , Wampanoag Indians lit signal fires at times of gatherings along the river. This would also be the practice for gatherings at the Sachem’s Knoll nearby. Another landmark of the area is a lone pine that stands sentinel at the edge of the long drive to the farm. It is said to be several hundred years old. In North Kingston, the neck that the Narragansett Indians called Namcook, stretches out past the narrows at the end of Bissel Cove into Narragansett Bay. Today we know this peninsula as Rome Point. It is thought that this is the location where the “Sachem’s Deed” for Providence was handed to Roger Williams. The Narragansett summer encampment was nearby during this period, as was an area just north of the point known as Homogansett, a sacred site of council and tribal festivities. [iii] Beach off Rome Point, Chafee Preserve. Photo by the author. 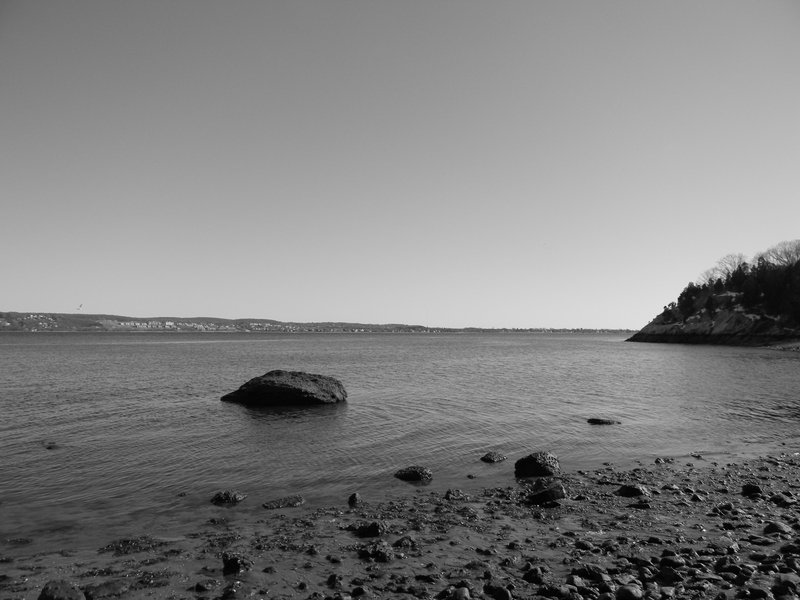 It was at Pettaquamscutt Rock in South Kingston, also “a noted Indian landmark”, where Roger Williams and William Coddington, obtained the deed to Aquidneck Island from Narragansett sachems. The great “round rock” has long been written of in local histories, and is featured prominently in the mural entitled “The Economic Activities of the Narragansett Planters”. Painted by Ernest Hamlin Baker for the Wakefield Post Office as part of WPA Project in 1939, the mural hung in the Post Office until 1999. It was re-installed, and may be seen at the Pettasquamscutt Historical society. The rock itself, is preserved in a small park in South Kingston where one may walk a hilly path where once part of Rhode Island was granted. Other natural rock formations would come to be associated with the conflict known as King Philip’s War. The “seat” of King Philip at Mount Hope in Bristol, Rhode Island is a natural outcrop in which lies a chair-like indentation. A highly romanticized view of the ledge where Philip’s Chair is located is portrayed in this 19th century print. It was within sight of this ledge that the Wampanoag sachem was killed, and ended the effort to route the settlers from southern New England. View of Mount Hope Bay photo by the author. Here, the greeting was more dramatic, when the armed Sakonett warriors who accompanied Awashonks, surrounded Church in a threatening manner. Calm was restored, though not until a chosen bodyguard tasted the rum that Church had offered, to be sure it was not poisoned. The Captain eventually persuaded the Squaw sachem that it was better to align her people with the English than to risk their fate to Philip and his struggling campaign. 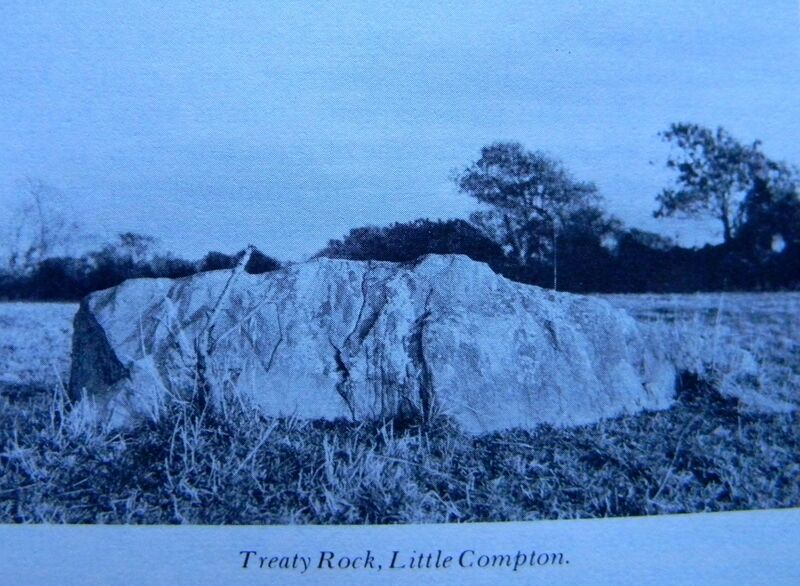 “Treaty Rock” rests on the old farm still owned by the Richmond family, which was re-named in tribute for the historic meeting on the site. Since 2007, the Little Compton Agricultural Trust, has partnered with the Nature Conservancy, and the Rhode Island Lands Preservation Commission, to protect 115 acres of the 120 acre farm; designating 95 acres to remain as Treaty Rock Farm, working farm, with 20 acres being designated for a maritime shrub land habitat preservation project. While these sights have been preserved for future generations of Rhode Islanders, other places of historical memory have been abandoned, or threatened by development. Such is the case with the site known as the “Queen’s Fort” in Exeter, Rhode Island. The first specific description of the “fort” as a historical site was printed in Elisha Potter’s Early History of Narragansett: “ Queen’s Fort, near the line between North Kingstown and Exeter; it is on the summit of a high hill completely covered with rocks, and the Fort appears to have been surrounded with a strong stone wall; there is a hollow in the rock which has been always known as the Queen’s bedroom, and a large room, the entrance of which is nearly concealed, which is supposed by tradition to have been a hiding place for the Indians, and in which arrow heads and other things have been found. [v]” Intense interest always surrounded the site, and the Rhode Island Historical Society Bulletin featured several articles and photographs of the site during the 1920’s. The site was donated to the historical society in 1931 by Marsden Perry, and placed on the National Register of Historic Places in 1980. Today, the site is unmarked, and the small parking area that once existed is blocked off by a row of boulders. The fort that rests atop the hill takes much study to resemble the maps and photographs taken from those earlier articles, as the site has undergone its most extensive transformation in the last one hundred years. Before donated, the land on which the rocky balustrades rested was farmland for an extensive period. The new growth timber that grew, and then replenished itself over the next few generations cover much of what might be found. On the hillside, the rock walls that were once built along the sides of the natural rock beds have been disturbed, and while the “impressive spiral enclosure” as Howard Chapin termed it, at the top of the hill, still remains, stones from this also, have been taken for firepits, and litter in the form of beer cans and plastic bags are to be found throughout the site. Louise Duckworth, a longtime docent at nearby Smith’s Castle, remembers visiting the site as a young girl, and finding the “Queen’s chamber” once, in her wanderings. But she never found it a second time. On the blogsite Rockpiles.com, a contributor recalls an elderly man telling him that he too had known the queen’s bedroom and that he could stand within it’s cave-like opening. Looking today, the “cave” has been largely filled in, and the other areas of the site noted in Chapin’s article are more difficult to find. In Warwick, the site of Ponham’s fort, just off Warwick Neck facing Apponaug Cove, has become overgrown to the extent that it is unrecognizable. Now in private hands, the brass plaque that was affixed to a cement block by the Warwick Historical Society to replace an earlier plaque, has been removed by the owners for fear of vandalism. The fort was once the stronghold of the Shawomet Sachem Ponham during his struggles with the colonists that were part of the prelude to King Philip’s War. He was among the first to advocate for Philip and his mission of expelling the Europeans from New England. A band of his warriors ambushed Massachusetts troops returning from the Great Swamp Fight. Ponham was involved in several of the attacks during the war, and was captured in July 1676, with fifty of his warriors and put to death on July 25, 1676 by a party of Dedham and Medfield people. Historian J.W. Barber believed that Ponham, above the other sachems aligned with Philip, had the “energy and talent to have united the scattered tribe and infused into them his own spirit and courage[vi]”. Also in Warwick, the ledge known as “Mark Rock”, lying just south of the entrance to Occupawtuxet Cove, and an original boundary marker of the purchase of lands by Surgeon John Greene from the sachem Miantonomo, has long been a site of interest to Anthropologists and Historians for the petroglyphs found carved on the rock. When the land on which the great ledge lay was passed into the hands of the Cole Family, it became part of historic Cole Farm. Locals had long known of the rock, and by the early 19th century, “members of the Greene, Low, Lockwood, and Waterman families were routinely carving names, dates, and emblematic designs such as anchors, eagles, and flags upon the surface of the “Mark Rock” ledge”[vii]. Warwick historian Henry A.L. Brown explores the remaining ledge of Mark Rock. Photo by the author In 1835, the secretary of the Rhode Island Historical Society caught wind of the inscribed rock on Narragansett Bay. 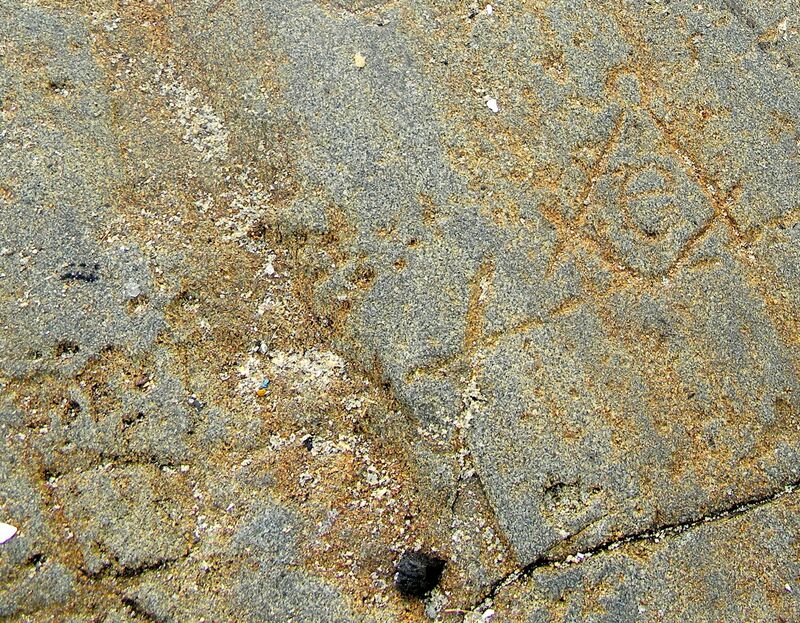 Webb and artist William Bartlett were among those convinced that the boats of Norse wayfarers had entered the bay, leaving their markings on rocks as they paused, as far inland as the Taunton River and Dighton Rock. They visited Occupawtuxet Cove on July 31st, and “after much fruitless search, we succeeded in finding the spot spoken of…it was probably once a place of resort for fishing or for clambakes, and the visitors were in the practice of cutting their names on the rocks; there was one date as early as 1762…”[viii] In their cursory examination and casual dismissal of the site, they pair missed entirely the 17th century petroglyphs that were later discovered by Edmund Delabarre. The Brown professor of Psychology had learned of the rock’s existence from Howard Chapin, who had learned of its location “only after much difficulty, many futile enquiries, and long delay”. A granite ledge divided by the Railroad in the 1940’s with the spur rail built to Quonset, it lies bordered on another side by the blacktop of Route 1. The ledge that contains “Devil’s Foot Rock” was once noted as a gathering place of the Narragansett, with it’s seat like boulder known as the Sachem’s Chair beneath the shade of a great pine, the ledge was included in a parcel of land sold as early as 1671, and served as a boundary of the lands of Fone’s Purchase. The legend associated with the rock, that of the devil, in the form of a puritan minister snatching an Indian woman from the rock, and leaving two footprints on the ledge, one of a human footprint, and another that was cloven. The site was among those most important to Thomas Bicknell, in his efforts to memorialize the Narragansett Tribe, even as they still lived and struggled economically on and around their reservation in Charlestown. Bicknell was certain that this site was the seat of Canonicus, the great Narragansett sachem, and even placed a crude monument there in the 1920’s with which tourists could pose, as they paused in their search for the devil’s footprint. The area was donated to the Rhode Island Historical Society in 1939, and is still maintained today, albeit quietly, by the state today. Vandalism is, of course, the primary concern, so there are no signs off Route 1 for visitors, just a graveled parking lot, and a small path to the ledge beyond a copse of trees. The village of Black Rock in Coventry was named for the large, dark rock that was said to be a place of Native American marriage ceremonies[x]. The village was not founded in 1814 when William Greene sold the parcel to the Black Rock Cotton Manufacturing Company, and held 40 people by the time that the mill was established. Years before, when the area was inhabited by the Native Americans, the site did in fact, have its true origin as a ceremonial site, with at least one coronation also held there. The areas within Kent County were as well known to the Narragansett as the encampments along South County’s shore. Mishnock, the swampy environs of the pond we know today, was the place of refuge for the survivors of the Great Swamp Fight. Chiponaug, was a large encampment located at “a separated place” among the woodlands and marshes of Warwick, Rhode Island. Throughout the state are sites that echo the place names given by the indigenous peoples. In adapting these sites into the early narratives of American history, writers often romanticized these places of tragedy, honor, and ceremony. For the Narragansett, and other tribes, it is perhaps not a bad turn of events that sites like Queen’s Fort and Ponham’s encampment be allowed to return to their natural state, and some relief that other sites have faded from historical memory. For those like myself, who have always felt a keen, unspoken connection with the landscape of New England, we find these places as the indigenous peoples did, with a sense of awe, and respect for the power that laid out the landscape before us. No matter the legends that have been printed on paper, or the markers we have left at sites to commemorate an historic meeting, or some victory or defeat in war; the landscape draws us back again to contemplate it’s unwritten history, because we believe that it will endure, long after any mark of our footprint upon its surface. [i] Literally “Large Stone House” in the Algonquian language. See Geake, “Historic Rhode Island Farms” p. 127 [ii] Lafatasie, ed. “The Correspondence of Roger Williams” Vol. 1, p. 34 [iii] See Cranston, G.T. 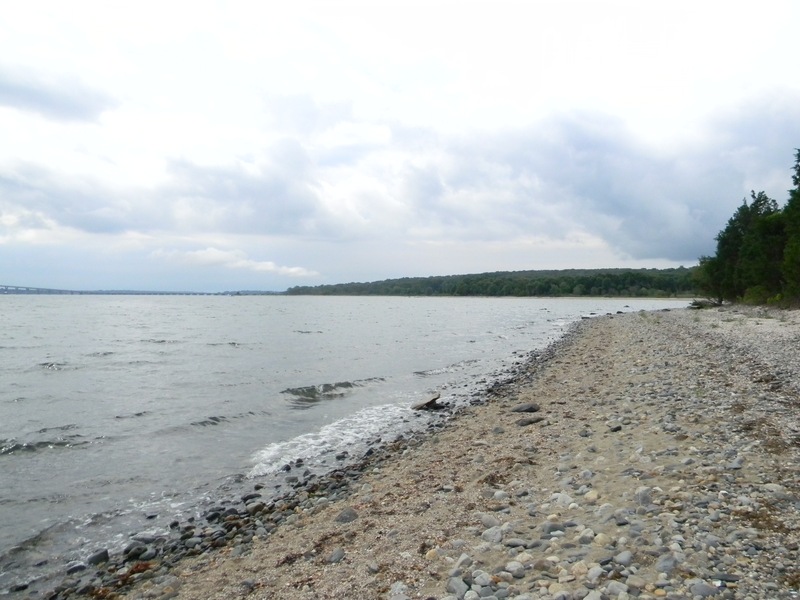 “The History of Rome Point since the mid-1600s” The North Kingston Independent July 17, 2014 [iv] Mather, Increase “History of King Philip’s War” p. 180 For a more detailed examination of the events of Anawan’s capture and the site, see Schultz & Tougias “King Philip’s War: The History and Legacy of America’s Forgotten Conflict”. [v] Potter, Elisha Reynolds “Early History of Narragansett” Providence, R.I., Marshall, Brown & Co. 1835 See also “Rock Piles: A Visit to Queen’s Fort in Exeter, R.I.” http://rockpiles.blogspot.com/2010/01/visit-to-quuens-fort-in-exeter-ri.html [vi] Pierece, Ebenezer Weaver “Indian History, Biography, and Genealogy Pertaining to the Good Sachem Massasoit of the Wampanoag Tribe, and his Descendents…” p. 186 [vii] See Devine, Charles M. “An Historical Sketch of “Mark Rock” on Narragansett Bay, R.I. “ (1981) Warwick Historical Society, Henry A. L. Brown papers. p. 87-88 [viii] Ibid p. 89 [ix] Delabarre shared his findings with several articles in the Rhode Island Historical Society’s Bulletin with his articles on “The Inscribed Rocks of Narragansett Bay”. See Geake, “Keepers of the Bay”, for a more detailed overview of his work during this period. [x] Boisvert, Andrew “The Coventry Patch” Additional information has been shared through oral history from Nancy Brown-Garcia, Narragansett. This entry was posted in Native American history and tagged Rhode Island. Bookmark the permalink. Thanks for doing your part in helping preserve these historical memories through spreading information and awareness!